slings, harnesses and wheelchairs, there's something for everyone... or every dog. All of products below come in a variety of sizes - there's one that will work for your dog! Many older dogs suffer from some degree of weakness in their hind legs. This can be caused by hip problems, arthritis, IVDD and a host of other conditions. Some seniors may just need short walks with rest stops but others can benefit greatly from harnesses and slings which let you take some, or all, of the weight off their rear legs/hips. 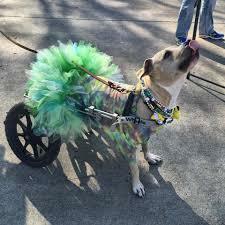 For senior dogs, or dogs at any age, who are paralyzed, doggie wheelchairs can make the world of difference. Additionally, dogs who have mobility issues but are able to walk short distances often enjoy a daily trip in their stroller... they can walk if they want to, or are able to, but can also ride when they need to. Dogs of any age can slip and slide on slick flooring, but large-breed puppies and older dogs seem to have the most problems with this. For seniors the risk of damaging joints/ligaments in a fall or from over-stretching is increased, so it's important to help your old dog keep his feet at all times. Non-slip socks and boots can help, as can putting down rugs or non-slip mats, runners or rugs on tile/wood floors. Here are a few resources you may find useful in kitting your senior dog with mobility accessories.